Alpensia Resort in Pyeongchang has been a favourite holiday, skiing and snowboarding resorts for Koreans for years, especially in winter due to its marvellous ski slopes. Pyeongchang is selected to host Winter Olympic in 2018. How to go from Incheon Airport to Alpensia Resort, Pyeongchang? Gangnueng Bus is operated by Gyeonggi Express at Incheon Airport. 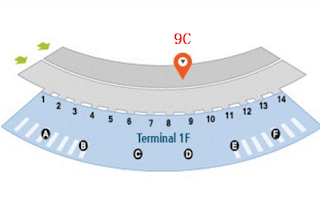 This bus departs from Bus Stop 9C at 1st Floor, arrival terminal or Terminal 1 and also from the new Terminal 2 of Incheon International Airport. The one way bus ticket fare from Incheon Airport to Alpensia Resort Pyeongchang is 30,000Won. Gangnueng Bus departs from Incheon Airport and then stops at Gimpo Airport to pick up passengers. After Gimpo Airport stop, this bus will go all the way to Pyeongchang. The first stop at Pyeongchang is Pyeongchang Service Station. This is followed by Alpensia Resort. In winter, Gangnueng bus from Incheon Airport will also stop at Yongpyong Resort, After stopping at Alpensia Resort and Yongpyong Resort, this bus will continue its journey to it's final destination, which is Gangneung Cross-Country Bus Terminal. In short the route for Gangnueng Bus is as below. Note that Alpensia Resort Pyeongchang is the THIRD from Incheon Airport. Incheon Airport -> Gimpo Airport -> Pyeongchang Service Station -> Alpensia Resort -> Yongpyong Resort (only winter) -> Gangneung Cross-Country Bus Terminal (Final Destination). There are four bus departing from Incheon to Alpensia resort Pyeongchang daily, two in the morning and two in the afternoon. The first Gangnueng Bus departs from Incheon Airport at 7:30am in the morning. This is followed by the second bus at 11:00am. The third bus to Alpensia Pyeongchang will only departs from Incheon Airport at 3:00pm in the afternoon. The last bus from Incheon to Alpensia Resort Pyeongchang departs at 7:30pm. Based on information from Incheon Airport, the Gangnueng bus departure schedule at Incheon Airport is as below. The bus trip from Incheon International Airport to Alpensia Resort Pyeongchang will take about 2.5 hours to 3 hours. The second way to go from Incheon Airport to Alpensia Resort Pyeongchang is to take the Purple Ski Bus, operated by Daewon Express/Grace Travel Co. Ltd. Purple Ski Bus is well-known for its special service to bring tourists to ski resorts from Seoul, Gimpo Airport and Incheon Airport. The bus ticket fare for Purple Ski Bus is USD$35 on way for adult. This is equivalent to approximately 40,000Won. Children can get discount for bus fare. The bus fare for child is USD$20.This fare is slightly more expensive than Gangnueng Bus. However, it is a dedicated service to bring you to Alpensia Resort compared to Gangnueng Bus which is a public bus. The good thing about taking Purple Ski Bus is that you can make advance booking online before you arrive in Korea. That way, you do not have to worry that the bus is full. Another advantage of Purple Ski Bus is that you can also book your return bus ticket from Alpensia Resort Pyeongchang to Incheon Airport or Seoul. There are two buses from Alpensia Resort in Pyeongchang to Incheon Airport daily. The departure times for the return bus are 9:00 AM in the morning and 12:00 PM (noon) respectively. Whether you are visting Alpensia Resort for skiing, snowboarding, or holiday stay at Holiday Inn Alpensia Resort, you can take either Gangnueng Bus or Purple Ski Bus from Incheon Airport to Alpensia Resort Pyeongchang. Apart from the difference in bus ticket fares, the suitability of bus timetable with flight arrival time in Incheon Airport is often considered when choosing which bus service to use. After July 2017, you may also use the high speed train from Incheon Airport to Pyeongchang which cater for the 2018 Olympics Winter Games and Paralympic. For the time being, Gangnueng Bus and Purple Ski Bus are still the most convenient option to go from Incheon Airport to Alpensia Resort in Pyeongchang. February is still very far away. Maybe you can try to make your booking in December or January for Purple Ski Bus. For Gangnueng Bus, you can buy the ticket at the airport counter. My trip to Alpensia Resort,Seoul this coming December. I'm planning to take GANGNUENG BUS, may i know the location of the counter in airport? And how much the fare charged for children? You can inquire at the ticket office at Gate 4 or Gate 9 at the arrival hall of Incheon Airport. For children ticket, it depends on the age of your children. Generally, there are discount for children below 12 in Korea. Hi there. Thank for your info here. between, if i plan to get Purple Ski Bus. May i know when i can make the bus ticket reservation via website? My trip date on 17/12/2016 to Alpensia Resort. You can try booking in middle November once the ski season started. Enjoy skiing in Alpensia! I would like to know how much of the fare change from Alpensia Resort back to the Seoul Myeongdong? I'm planning to take Purple ski bus. Thank you very much. For one way fare charge from Alpensia Resort back to Seoul Myeongdong, the fare is USD19. Round trip ticket will be more worth it as it is only USD34. I have checked with PurpleSki. Their website reservation page will be reopen on the 17th oct - next Monday. Hi chicken share, can you explain further the $34usd roundtrip bus ticket from myeongdong to pyeongchang. Can you help me how to purchase that. Thanks. Hello, is that there is no way for us to book the Gangneung bus? The ticket must be purchased over the counter? I would like to check how should I book the Gangneung Bus tickets from Incheon airport to Alpensia Ski Resort? Or I just go counter to purchase when I arrive? Just worried the bus tickets won't be available by then..
You can buy Gangneung Bus ticket to go to Alpensia Pyeongchang at the counter when you arrive at Incheon Airport. If you want to purchase the ticket in advance, you can book the purple ski bus. Hi, I am thinking of booking a purpleski bus for returning trip from Yong Pyong Resort (not Alpensia) to Incheon Airport. I am worried if the bus journey will take very long as I need to catch a flight on a Friday around 2pm. Will I be fine if the bus set off at 915am from Yong Pyong Resort? What other alternatives would you advise? Thanks very much! The first bus from Yong Pyong to Incheon Airport starts at 4.00am. There should be no problem for you to catch the flight at 2pm. Thank you for the info. Will you be able to send a link to the website to book this bus trip from Yong Pyong to airport? Thank you! Hi, I am planning to take shuttle bus from Alpensia to Incheon. I need to reach the airport by 9pm. Is there a public bus which I can take? The purple ski bus latest return timing is 12pm and I would have reach the airport too early if I take the purple ski bus. Thanks. I think the timing is just okay, not too early to reach Incheon Airport keeping in mind that there are a lot to do, see and shop at Incheon Airport. Enjoy your time in Alpensia. If you want to do online booking in advance via website, I suggest you take Purple Ski Bus instead. I do not know of any online booking for the Gangneung Bus. I like to catch the 3pm purple ski bus to Alpensia but I will arrive at 1:50pm. Will I have sufficient time to pass immigration and pick up luggage in order to catch the 3pm bus please? Depending on arriving traffic at the airport, the time to pass immigration and pick up luggage may take 1 hour. If your flight arrival is slightly delayed, you may miss the 3pm bus to Alpensia. Yes, you can purchase the ticket at Gimpo Airport bus ticket counter. The bus schedule from Gimpo Airport to Alpensia is approximately 40 minutes after Gangneung Bus departure from Incheon Airport. Hi, I would like to know if the Gangneung bus is a coach type or just a normal public bus. Will be arriving with languages. It should be coach type and you can bring languages with you on the bus or store below the bus at Incheon Airport and collect it upon arriving at Alpensia resort Pyeongchang. Hi, can i purchase purple ski bus ticket at the counter when i arrive at Incheon Airport? I'll be arriving on 11/1/17 but i cant make reservation as the booking needs to made 3 days in advace. Kindly advice. Thank u.
Hi, if i take Gangneung bus to Aplensia resort on 8 Feb 2017 Time 7:30am, will the bus full if i just buy the ticket on that day morning ? How can i make sure i have a seat ? is it possible to make booking via email ? How many seats per each Gangneung bus ? Thanks. The purple bus departure schedules shown here is different from those posted on the purple bus online system since it's high season now. Is the departure schedule of Gangneung bus posted here up to date? Hi I would like to know for Gangneung bus to Aplensi resort the tickets can purchase at the airport? Will I be able to catch a bus upon arrival? The purple bus I check on line already fully book for Dec 17? So fast?? Yes, you can buy the tickets at Incheon airport upon arrival and then catch the bus. For purple bus, perhaps you can email them to inquire about the availability even though it is full in the online booking. Hi thanks for this super helpful info. Can you run thru to me the bus from myeongdong to pyeongchang. Can you share it to me how. Thanks!